FILE - Austrian policemen check vehicles on the Austrian side of the Hungarian-Austrian border near Nickelsdorf, 70 kms southeast of Vienna, April 25, 2016. 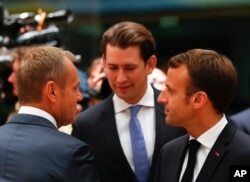 FILE - European Council President Donald Tusk, left, speaks with Austrian Chancellor Sebastian Kurz, center, and French President Emmanuel Macron during a round table meeting at an EU summit in Brussels, Oct. 17, 2018. FILE - Hungarian Interior Minister Sandor Pinter, foreground, inspects the enlarged transit zone set up for migrants at the country's southern border with Serbia near Tompa, 169 kms southeast of Budapest, April 6, 2017. Hungarian Foreign Minister Peter Szijjarto told reporters that contrary to his government's policies, the agreement would promote migration as "good and inevitable," and "it could inspire millions" of migrants. The United States was the first to step away from the negotiations, deciding in December of last year that the proposed agreement was "inconsistent with U.S. immigration and refugee policies." Then-U.S. Secretary of State Rex Tillerson said the United States supports international cooperation on migration issues, "but it is the primary responsibility of sovereign states to help ensure that migration is safe, orderly, and legal."